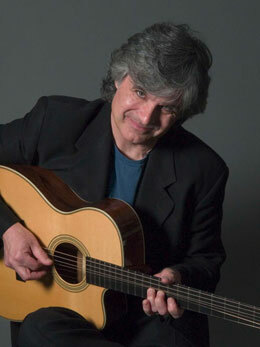 As a young working musician in London in the 1970's, Laurence Juber got an extraordinary break when Paul McCartney picked him to become lead guitarist in his band, Wings—and the rest is history. Several decades, uncountable performances, and numerous critically acclaimed albums later, he's known as a world-class guitar virtuoso, the kind of guy Fingerstyle Guitar magazine would—and did—vote Fingerstyle Guitarist of the Year. Along the way, he won two Grammy Awards, including a Best Rock Instrumental award for the track "Rockestra" from the Wings album, Back to the Egg. As a studio and touring musician Laurence has worked with such artists as George Harrison, Ringo Starr, Paul Williams and Al Stewart, and his guitar playing is featured on films such as "Dirty Dancing" and "Good Will Hunting," as well as many television shows. Tonight Laurence features numbers old and new, including arrangements of Beatles songs and pieces from his new solo guitar collection, Wooden Horses, featuring his unique fingerstyle technique and extensive use of alternate tunings.